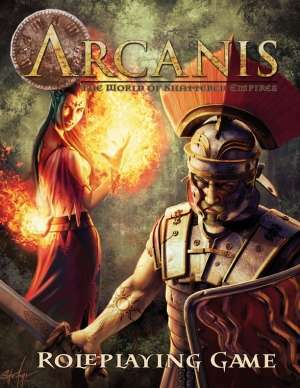 Like many people, I’ve enjoyed adventuring in the world of Arcanis as presented for the Dungeons and Dragons 3e ruleset for a good ten years now. It’s good to see innovative alternate realities survive the game mechanics that they were originally written for, but whilst many survive version changes it is less common for an entirely new game to be created just so that alternate reality will continue to thrive. This mighty tome has set out to provide a comprehensive system rooted in the Arcanis we already know and love, whilst introducing that world clearly to those who have not ventured there before. The work is made up of four sections, and begins with the Codex of Arcanis, thus getting you all excited (for the first time or anew) to go visit, with subsequent sections explaining the mechanics of doing so. A sweeping overview of history catches you up, event piling upon event to lay the groundwork for the current situation, underpinning the traditions and customs prevalent today. Intrigue looms large, even more than ancient racial tensions, making this an excellent setting for those who would scheme as well as brawl. Each state or region covered in the gazetteer is described in terms of how they came to be, with indications of likely tensions both internally and with other states. Beliefs and popular opinions, political issues, economic circumstances, all the things that go to mould the citizens’ outlook are covered, making the whole place come alive as you read. For each state, there are useful notes such as the way in which citizens are named – useful if you want to make that your homeland, or for the GM creating NPCs – and a summary of the state of affairs in the present day. Although there are comments on religion throught the gazetteer, the Codex rounds off with an overview of religion throughout Arcanis, still a potent force despite a significant minority opinion that if there ever WERE any gods, they are dead and gone now! For those who still acknowledge deities, however, there’s a comprehensive run-down on the entire patheon, plus details of major churches devoted to their worship. Next comes the Codex of Heroes. This contains everything that you need to know to create and play your character – attributes, archetypes, races, nationalities, backgrounds, skills, flaws, talents and so on. It starts off, however, by explaining the core mechanic. When you want to do something that has a chance of failure, or that is opposed by someone else’s actions, you need to roll an Action Roll. The dice you need vary depending on what you are attempting, core is a 2d10 roll (the ‘Action Dice), along with an appropriate die for the Attribute you are using and any skill, talent or circumstance modifiers, and the result is matched against a Target Number set by the Chronicler (GM), or by an opponent’s roll if you are brawling or competing with someone. Target Numbers go up the harder the thing you are trying to do becomes. That’s the core mechanic, reasonably straightforward and robust. Interestingly, there is as much discussion about ensuring that die rolls are only made when appropriate as there is about what you need to roll! Recognition that getting the dice out can be quite disruptive to the dramatic flow of the story, and that it should only happen when absolutely necessary. Now, on to character creation proper, beginning with devising a concept for your character. It will likely fall into one of four archetypes: Martial, Expert, Arcane or Divine. The Expert is one who lives by his wits, the Martial excels at combat, the Arcane covers magic-users and the Divine those who dedicate themselves to the service of a deity. Or, in other words, your character class! Each has a range of sub-options, however, so your choice can be tailored to suit your concept. Then a point-buy system is used to determine your physical and mental Attributes. Some skills come from your chosen Archetype, and more can be added. Oh, and you will need to choose a race, and decide where your character comes from and his background. Each choice will have a material effect on your character as well as taking him from a bunch of statistics to a living, breathing inhabitant of the alternate reality you are about to share… everything is embedded closely into the Arcanis setting – a strength if that is where you will be playing, but limiting if you like the system but wish to adventure elsewhere. Character creation is presented in two stages, first an overview that explains just what is needed, then sections laying out the options for each stage in exquisite detail. After providing useful things like equipment lists, the Codex of Heroes moves on to Character Advancement, showing you how your character can grow and progress during play, and then rounds out with an interesting concept, Paths. These are selected as the character advances, reflecting the direction which his life is taking and often providing a way in which he, or perhaps others, might sum him up. Like the Archetypes and Backgrounds – which serve a similar role for the starting character as Paths do for more advanced ones – they provide mechanical advantage as well as a lot of flavour. In that respect, they can be seen as analagous to ‘prestige classes’ or similar in other games. Many have more than one level which you may progress through as your skills and abilities improve. There is a fascinating range of options to choose from. The next section is the Codex of Conflict, which discusses everything you need to know about the game mechanics about fighting within this ruleset. It starts with the basics, then adds in all the variations and added complexities that more experienced players, or those who really enjoy combat, can use. Unlike many systems, combat with this ruleset does not proceed in rounds. Instead it proceeds in a fluid sequence based on a starting Initiative with subsequent actions based on elapsed time since the previous action, the time interval being based on how long each action takes. This is moderated by a master ‘clock’ that steps through, each participant in the combat taking their action at an appropriate time. Plenty of encouragement is given to the Chronicler to be responsive to innovative moves from characters rather than to be wedded to the letter of the rules, rewarding tactical play and unusual ideas for combat moves by allowing them to happen rather than to insist on die rolls for everything. The Codex then moves on to details such as movement rates (depending on how fast the character running, flying or swimming happens to be) and other factors that may influence combat. How much account you wish to take of these is left open, with the suggestion that the less important the combat is in terms of plot advancement, the more it is safe to abstract the actual brawl… unless, of course, you and your players relish playing out combat in minute detail. For those who like detail, a wide range of combat manoeuvres and actions are available, enabling each character to develop their own distinctive style of combat… or to take advantage of each opportunity that presents itself. Next comes a very comprehensive and detailed example of combat, whilst there’s no substitute for creating some characters and getting the dice out yourself, it provides a fair understanding of the process. As always it will work better once everyone is familiar with the mechanics, although to begin with as long as the Chronicler has mastered the rules everyone else can be directed when to act and what to roll. The Codex rounds out with a comprehensive section on Adventuring and a miscelleny of things that can be encountered whilst doing so – modes of travel, food and drink, how much you can carry, the uses and abuses of objects and even poisons. Then comes the Codex of of Magic, which sets out to expound on the different forms of magic to be encountered in the game, how the rules work for spell-casting and, of course, massive lists of spells that magic-using characters may learn and cast. There’s the usual tension between those who wield divine power, drawing on the deities that they serve, and those who are sorcerers or mages who channel the very energies of creation through their own bodies to cast their spells… yet all wield ‘magic’ in a similar manner, irrespective of the source. Each form of magic has its distinctive style of study and of delivery, so practitioners of Elder sorcery are precise and deliberate whilst Eldritch sorcerers are more ‘quick and dirty’ in their application of the same power, that of creation itself. Theurges draw on the Gods, and are often priests, while Primal magic is the domain of shamans and others who draw their power from nature and spirits. Rarest of all magics is Psionics, where change is driven, power is drawn, from the practitioner’s own mind. Within each type of magic there are different traditions. Starting spell-casters will have limited access to but one tradition, as they gain in experience and power they may begin to study other traditions as well. Following this overview, the actual game mechanics of spell casting are discussed: these are common whatever sort of magic you are using. Many spells can be cast during combat and – like any other actions – they take a finite amount of time, which is factored into the flow of combat along with everything else that is going on. Spells can often be modified within set parameters at the time of casting, but they all take effort, such that a character cannot cast another one straight away, at least not without risking damage to himself! The remainder of the Codex, and indeed the entire book, is made up of a comprehensive list of spells from which spell-casters of all types may choose, depending on the source and tradition of their powers. An index, character sheets, and ‘spell templates’ – for use with miniatures when working out area and cone effect spells round things off. There are one or two minor quibbles and typoes that better proof-reading would have caught, but the one thing I’d have really liked would be a map of Arcanis to complement the detailed and absorbing gazetteer! Other than that, it’s a masterful game, well-honed to running the sort of adventures that the setting has always engendered. If you want to play in this alternate reality, and are not wedding to what is now an old version of Dungeons & Dragons for a ruleset to hang your game upon, this is definitely worth a look. It is a good, solid and elegant game mechanic in its own right, but would require some work to use in any other setting, the level of integration between ruleset and setting is both a strength and a weakness, depending on what you want to do. I love this game. It has such a rich storyline and a wonderful character creation system that it is the only campaign that I am presently playing. No D&D living campaign has come close to what these people put out. They do have some technical issues with editing and with their website, but overall this game is solid!